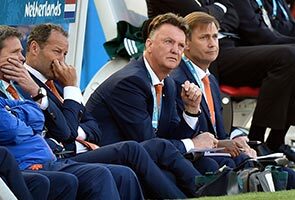 SAO PAULO: Netherlands coach Louis van Gaal hit out at Dutch media on Sunday after details of a closed training session leaked out ahead of their World Cup game with Chile. Van Gaal said the breaches, which included indications that Dirk Kuyt may deputise for suspended striker Robin van Persie, were not helping the Dutch World Cup campaign. "If we have a closed training session, somehow or other Dutch media find out about something and I don't like it because it doesn't help, it works against us," he told reporters. "I really don't understand that because I really think all of us should be singing from the same hymn sheet here, but apparently we can't do that." While some training is done in front of the cameras, much of it is closed to media to allow teams to work on tactics and formations in private. Van Gaal said he wouldn't discuss possible personnel changes, to avoid giving Chile any possible edge ahead of Monday's game in Sao Paulo. Both teams have qualified from Group B but they will want to finish top to avoid a likely last-16 match-up with hosts Brazil. "I'm not going to discuss individual players because I don't want our opponents to know more than they're supposed to know," he said.